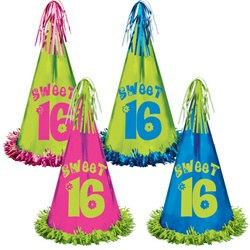 Celebrate your sweet 16 Birthday with these Fringed Foil Sweet 16 Birthday Party Hats! The vibrant colors on these hats are perfect if you want to stand out in the crowd. These hats are made from foil and have fringe on the top and the bottom of the hat. If you want more fringed hats, make sure to look at our Birthday Hat selection. They come assorted in shades of green and pink or blue and pink. Get several for your party guests for a truly retro Sweet 16 party. Remember, nothing is sweeter than turning 16 and you are one step closer to becoming an adult.